Versatile P.A.F.-type humbucker. Great for country, jazz, blues, funk, classic rock and heavy rock. Late-'50s, vintage-correct, humbucker sound. Warm and crystalline clean tones. Full and bright distorted tones. Smooth sustain. Classic appointments include plain enamel wire, long legged bottom plate, vintage single conductor cable and no logo. Compared to the SH-55 Seth Lover, the '59 has slightly more scooped mids and is vacuum wax potted for squeal-free performance. Available in both neck and bridge models. Often a '59 neck is used together with a hotter bridge pickup like the SH-4 JB or SH-13 Dimebucker for extra versatility. For balanced and warm instruments. Works especially well with mahogany bodies and rosewood fingerboards. Four-conductor cable. Trembucker. Nickel or gold-plated cover. 7-string version. 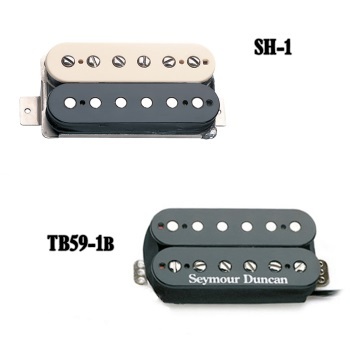 Seymour Duncan logo. Available in matched set of '59 bridge and '59 neck. Colors (humbucker spacing).